“Boys just aren’t that hot into arts and crafts right now,” said Teneen Dobbs, owner of Kit & Kaboodle in St. Carmel, Ind., during a recent TDmonthly Magazine survey of 66 specialty retailers. But with some recent offerings, they could be. Many retailers consider crafts “a girl thing,” while others perceive a needy niche. “There’s little on the market geared for boys,” noted Tricia Cooper, buyer for Le Jouet in Metairie, La. Dr. Mike Brody, a child psychiatrist and chair of the Television and Media Committee of the American Academy of Child and Adolescent Psychiatry, believes arts and crafts help children develop concentration and better motor skills. Thomas R. Smith, a stop-motion animator for Cartoon Network’s “Robot Chicken,” couldn’t agree more. Playing with craft toys helped him develop skills necessary for his future career. Smith grew up to do just that, animating three-dimensional characters and winning an Emmy in 2007 (Outstanding Individual Contribution to an Animated Series) for his efforts. Today Jakks Pacific still carries the torch with a “new-and-improved” Creepy Crawler kit that churns out twice as many creatures in half the time. Technical Illustrator Stephen Kowalski credits Venus Paradise Coloring Kits and other crafts, such as mosaics and paperweight kits, for developing his skills. “The coloring kits of cars, boats, airplanes and trains would get worked on right away — even taped to the wall — while the pictures of flowers stayed in the box,” he told TDmonthly. His strategy worked, although Call, too, shied away from flower paintings. 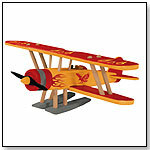 Today, Dimensions Crafts’ PencilWorks and PaintWorks lines offer several color-by-number sets geared to young males. Although today’s market seems smaller, there are still arts-and-crafts items for boys. “We’re doing fabulous with Orb Factory Sticky Mosaics,” said Theresa Oppenheim, owner of Toy World in Wayzata, Minn.
Ginger Mulligan, owner of Fantasy Island Toys in Fairhope, Ala., sells loads of Alex Pottery Wheel for both girls and boys. And My First Painting by Alex Toys, is doing well at Playville in Covington, Ala. “We sell approximately 72 a year,” said Owner Stephanie Dupuy. Cooper is having success with My First Portrait by Creativity for Kids. Given cultural gender anxiety and suspended art programs in schools, Dr. Brody feels that today’s boys are discouraged from pursuing the arts. But, he said, both girls and boys can benefit from pulling away from their video games to enjoy the hands-on experience of tangible arts-and-crafts play. Creepy Crawlers Bug Maker by JAKKS PACIFIC INC. Kids can transform slime into bugs by pouring the special Plasti-Goop compound in the molds and turning up the heat. Then they let the creatures cool and out pops something scary. The set includes a baking oven, four Plasti-Goop bottles, a detailing pen with four tips, two molds, a goop FX pick, two storage trays and a spatula and cooling tray. The product requires one 60-watt, small-base light bulb (not included). “There is a very strong nostalgia factor with Creepy Crawlers that has kept the toy relevant to young parents today. They recognize the smell of the baking-bug goop and are instantly brought back to days when they were making and baking bugs and Creepy Crawlers critters themselves. Today’s Creepy Crawlers' Bug-Maker Ovens are safer than ever before,” said Genna Rosenberg, senior vice president of corporate communications and investor relations for JAKKS Pacific Inc.. Carefully gliding among the coral, playful dolphins enjoy a swim in their favorite cove. This delightful kit includes 12 colored pencils, a sharpener, printed board and kid-friendly instructions to create this underwater masterpiece. Size: 9" x 12"
Frolicking dolphins are sure to put a smile on your face as you paint this ocean scene. Everything you need is in the kit, including printed canvas board, eight acrylic paints, paint brush and instructions. Ready and waiting for another adventure is this adorable pair of pups. Designed for all skill levels, this paint-by-number kit includes a printed canvas board, eight acrylic paints and a paint brush. Become a pottery pro with a real pottery wheel and a variety of included tools to position and sculpt your clay. The pottery wheel includes six distinctive carving attachments with an adjustable tool arm, carving blades, outline shaping tools, shaping tube and excavator, 2 lbs. grey and terra cotta clay, six colors of paint, sponge, paint palette, two brushes, clay cutting cord, 80 mosaic tiles, eight glass jewels, glue, AC -adapter, and instructions. 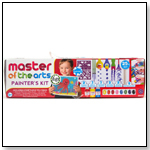 With this set, kids can mix their own colors and paint on a real artist’s canvas. They can begin with the printed outlines, then go wild with personal touches. Each set comes with a 10” x12” canvas, three brushes, six tubes of acrylic paint (12ml. each), a mixing palette and a color wheel. “Children will enjoy working on a real stretched canvas with high-quality paints and brushes. The provided line-art makes it easy for children to create an impressive canvas painting. They will feel an enormous sense of accomplishment and increased self-esteem,” said Elin Kabo, director of communications for Alex-Panline. Launch date: February 2007. Create a self-portrait, a picture of your pet, or a caricature of your favorite friend or family member. Includes 8 Faber-Castell Gel Sticks, 6" x 8" artist canvas, practice paper, blending stick, paint brush, outline marker and hang tabs. Add a little water and a few brush strokes and turn your portrait into a painting. 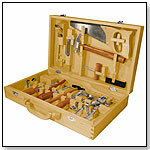 This Woodman kit includes durable beech wood components and the tools a child needs to build the toy. The pre-cut wood is slightly unfinished, allowing kids to sandpaper it for the finishing touches. 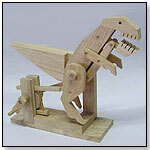 The set includes a hammer, dowels and glue for old-fashioned assembly. It also features paints and paintbrushes for detail and personalization. Launch date: August 2007; stickers added to the kit in 2009. Scaled down for little hands, this briefcase-style carpenter’s carry case for kids includes 16 woodworking tools: model maker’s hammer, carpenter’s hammer, carpenter’s pencil, mallet, saw, set of pliers, screw cutting tool, carpenter’s square, ruler, spirit level, wood chisel, screwdriver, Philips screwdriver, clamp, plane, and sanding block. Launch date: October 28, 2008. These rubberwood kits allow children and adults to create “mechanical marvels in natural wood.” Each set includes two layers of components packed in covered plastic trays, a parts list, sand paper, glue and visual instructions. Paint and a battery kit may be added to customize a model. The company requires a minimum wholesale order of 12 pieces. Launch date: August 2006. •See the New Toys Here! •TOY FRENZY! — We’ve Found Our Subjects! •Hollywood ToyBoy: Do Oscars Predict Toy Sales?